Amplifiers are often seen as a "necessary evil" because "all they do is increase the volume". We're happy to say we've found an amplifier that does much more than that. It's the Chameleon 3007 universal amplifier. This is a TRUE universal amplifier because it accepts headsets from most major manufacturers. Yes - it's true - it accepts Plantronics and GN Netcom headsets, as well as the exceptional headsets from Chameleon themselves. Moreover, it can improve the performance of headsets from other manufacturers. The Chameleon 3007 has several neat features, including a "magic switch" that gets rid of the "speaking into a tin can" sound that is associated with high transmit applications, and which can be a real decrease in call clarity and efficiency. The Chameleon 3007 amplifier also features a built-in recording jack. Chameleon amplifiers feature an incredible two-year full-replacement warranty covering defects in material, components and/or manufacturing. If during the warranty period a Chameleon amplifer fails, the replacement will be the same model or one of similar value if the original is discontinued. The new unit reinitializes the 2-year warranty. There are no charges associated with the replacement unit. 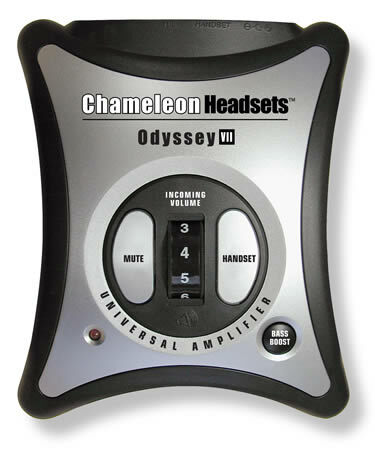 The Chameleon 3007 phone headset amplifer represents a great value for any call center, or anyone who is interested in the quality of their phone conversations.